THE FALL OF LIEGE Liege was a kind of natural key-hole into Belgium and France. It was a point at which many great railroad lines converged, including the line leading directly to Paris. It was also a centre of canals and high-roads. It was the outlet of the great plain of the northern German-Belgian frontier, and the inevitable passage-way for large bodies of troops. Liege had been fortified in 1886 by six primary outlying forts and six subsidiary ones. Each of the forts lay about four miles from the town, and two or three miles from one another, altogether forming a perimeter of some thirty miles. 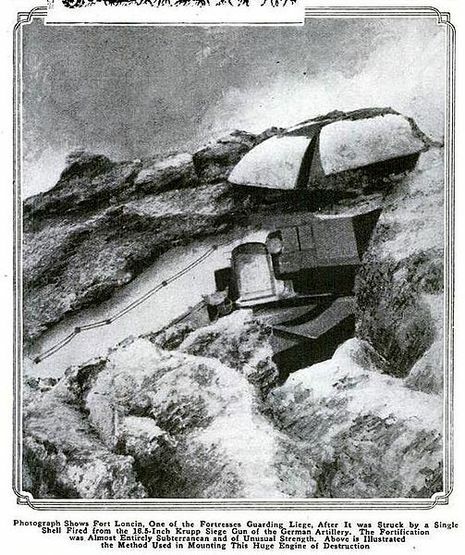 The forts had permanent garrisons and heavy equipment, as equipment was considered on August 1, 1914; and the fortress enjoyed a high reputation for military strength. For Liege, accordingly, the first invading German army, consisting of some 200,000 men under von Emmich, made all possible speed; and arrived before the gates of the city and demanded its surrender on August 5, 1914. The First, from Ghent to Tirlemont. The Second, from Antwerp to Louvain. The Third, from Mons to Perwez. The Fourth, from Brussels to Wavre. The Belgian army was to hold its positions as long as possible, in the hope of gaining enough time to be reinforced in Belgium by British and French troops. If compelled by the superior force of the German invaders to retreat before British and French assistance could reach it, the Belgian army was to keep its lines of communication into France open and to retreat in good order, to join the French and British forces in France. But in any event, the fortresses of Liege, Namur and Antwerp were to be defended with the utmost vigor, even if completely surrounded and isolated. Von Emmich's demand for surrender being rejected, the German commander undertook to obviate delay by carrying the town by storm. But the garrison, aided by a large section of the regular Belgian army, was able to drive back the Germans, and von Emmich was compelled to await the arrival of his heavy artillery on the following day. On August 6, 1914, the second day's quota of the invading German army also caught up to von Emmich, and the combined German forces succeeded in flanking the city and threatened to cut off the retreat of the supporting Belgian army. While the German field-guns played upon the forts, great masses of infantry were hurled against the Belgian troops defending the ground between the forts. The Belgians inflicted heavy losses upon the attackers, but the German General Staff had given orders that speed was more precious than life, and the Germans continued to press on. The defenders were greatly outnumbered, and had to be hurried from one gap to the other as the German attacks continued through August 6. Finally, the Belgians were driven between Forts Evegnee and Fleron, and the latter was completely demolished by the following day. The supporting Belgian troops therefore retired and left the defense of Liege solely to its garrison. Before the heavy German guns, the forts of Liege were helpless. Indeed, one of the revolutionizing military lessons of the Great War was that of the helplessness of fortresses before heavy field guns. Verdun itself, months later, was successfully defended against the German attack only by diverting the defence from the fortifications themselves to heavily-protected trenches in front of them. And Liege was no Verdun. 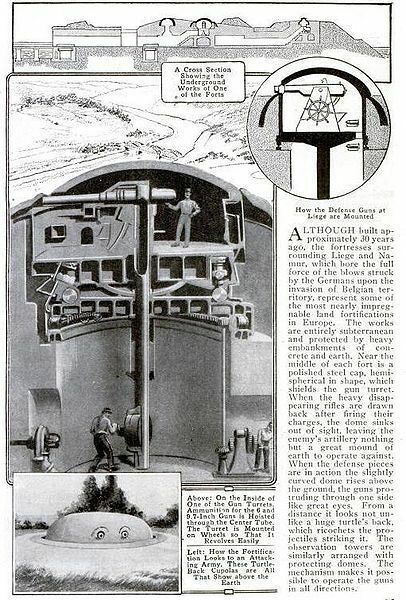 Its forts were largely isolated and unconnected, and their equipment had not kept pace with the latest developments in artillery science; and the German guns were using shells of a destructiveness previously unknown. The garrison, at the utmost numbering 30,000 men, was outnumbered by odds of almost five to one. General Leman, the heroic Belgian commander, soon withdrew his garrison to the forts on the west bank of the Meuse, as the Germans had already crossed the river below the forts. On August 7, 1914, the Germans occupied the town, from which the further attack on the forts was directed. The bridges across the Meuse thus fell into German possession. The passage-way south was now open to all the German troops invading Belgium, and von Emmich's forces could proceed with greater deliberation to reduce the rest of the Liege forts. The final attack was opened in earnest on August 10, 1914. One after one the forts yielded to the devastating German fire, the garrisons withdrawing to the forts remaining intact. Fort Boncelles was silenced on August 14, 1914, and several days later, the last and strongest of the forts, Fort Loncin, capitulated. The Belgians had fought with the utmost bravery against overwhelming odds. They had held back the German invaders for almost forty-eight hours, but such delay had not been unforeseen in the German plans. Indeed, it is probable that the reduction of Liege had occurred in less time than had been allowed in the original calculation* of the German General Staff. Complete German mobilization and concentration were not completed before August 12, 1914, and the full German advance did not get under way until August 14, 1914 or August 15, 1914; so that, despite the sternness of the resistance at Liege, it can hardly be said to have delayed the German campaign. The true value of the defence of Liege was a moral rather than a military value. 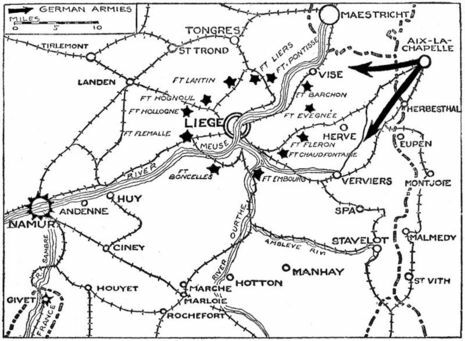 The general movement of the German troops was proceeding along the Meuse valley toward the city of Liege, which occupies both banks of the river. The investment of Liege was intrusted to Gen. von Emmich, with a body of infantry and cavalry totaling 150,000 men. The defenses of Liege consisted of twelve pentagonal forts, four miles apart, six on the right bank of the Meuse and six on the left bank, forming an irregular girdle or chain about the city. These forts were slimly defended by a garrison of 20,000 men. 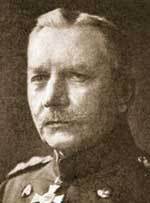 On the afternoon of August 4, von Emmich's forces began closing in on Liege from three directions. That evening a German envoy entered the city, demanding its surrender under the threat of immediate bombardment. Unawed by the numbers of the enemy, the brave Belgians declined to make terms with the invaders. An hour later, the German batteries opened fire on the outlying forts with their six-inch guns, but the shells rattled harmlessly against the massive walls. On the following day, the German eight- inch guns were brought into action, but these, too, proved ineffective. The great 16-inch German howitzers, which were destined to reduce the forts to powder, had not yet arrived. Furious at the vigor of the Belgian resistance, and fearing that any further delay might give France the opportunity to hasten her troops to the relief of the beleaguered fortress, von Emmich rashly decided to storm the city of Liege. A corps of 50,000 picked German troops was pushed forward between two of the outlying forts, advancing toward Liege in mass formation. A single Belgian division, of less than 10,000 men, uprose to give them battle, singing their national hymn as they faced the onrushing Huns. At close range, the Belgian machine guns opened fire on the dense German squares, cutting them down like grass. Again and again the Germans were driven to the assault, but they melted away by thousands before the withering fire of the Belgian guns. After four hours of sanguinary conflict the plucky Belgians, though outnumbered six to one, in a final terrific bayonet charge, drove the Huns from the field. With the arrival of the huge German howitzers, on the following day, the situation changed. These colossal howitzers, emplaced far beyond the range of the Belgian batteries, began throwing shells weighing a ton each into the Belgian forts. All six forts on the east side of the river were gradually pulverized. Fort Fleron was dismantled on August 6. On the following day Forts Chadfontaine, Evegnee, and Barchon succumbed to the avalanche of steel. Liege being now at the mercy of the invaders, Gen. Leman quietly ordered the evacuation of the city by the Belgian infantry. On August 7, Burgomaster Kleyer and the Bishop of Liege formally surrendered the city to the Germans. That night Liege was occupied by 10,000 German soldiers. The six forts on the west bank, of the Meuse, though deluged daily with shells, were yet to be silenced. So long as they held out, the passage of the German armies through the valley of the Meuse was menaced. General Leman, with the survivors of the eastern forts, had transferred to the western forts and was prepared to defend them to the last gasp. The Germans lost no time in bringing forward their great siege guns and training them upon the new targets. A continuous hail of shells fell upon the western forts. Fort Enbourg, after surviving an inferno of shells for ten days, was reduced to powder on August 13. On the same day the cupolas of Fort Boncelles were shattered and the electric lighting apparatus was destroyed. Nevertheless, though they fought in styg- ian darkness, risking suffocation from the gas shells that penetrated the interior, the brave garrison held out till the 14th, when the collapse of the inner concrete walls of the fort made surrender imperative. Fort Loncin was demolished on the same day, the last defensive shot being fired by a Belgian gunner whose right hand had just been severed. Gen. Leman was found unconscious and partially buried under debris in the sulphurous ruins of the fort. Gen. Emmich, the German victor, congratulated him for his gallant and noble defence of the fort, and bade him keep his sword which he had offered as a token of surrender. The heroic resistance of the defenders of Liege had not been in vain. For eleven days they had held in check the armies of von Kluck and von Buelow, enabling the French armies to complete their first mobilization and arrange a new offensive alignment. King Albert had ordered the mobilization of the Belgian forces on August 4, the day Liege was first invested by von Emmich's forces. A week later, on August 11, the army had a total strength of 120,000 men. Under command of Gen. Selliers de Moranville, the army formed on the bank of the River Dyle, with its left touching Malines and its right resting on Louvain. Subsequently, the right wing was extended to Eghezee in readiness to form a union with the French left wing, which rumor said was pushing northward into Belgium. This expectation, however, was disappointed, for the Allies were not as yet in a position to assist the Belgians directly. Outposts were so placed as to screen the Belgian army from the German advance. These outposts were soon in collision with the advanced posts of von Kluck's army.